Crazy, right? Sounds like God. 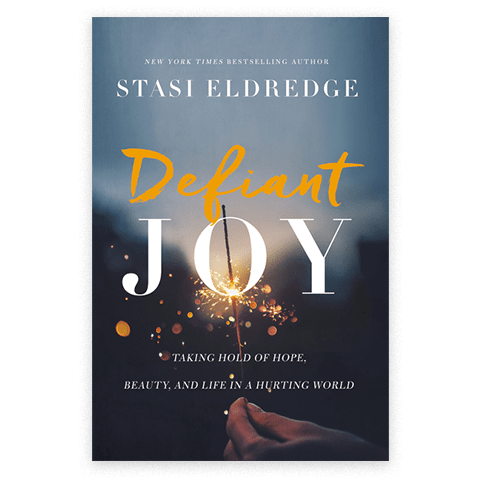 A God who laughs at the sneers of the enemy, stares suffering in the face, and proclaims with fierce love, “You do not have the final word.” And as He does, He captures our deep hearts with a hope that defies death. We are called to resist the lies of the enemy. Like Christian in Pilgrim’s Progress, we do not comply with the Vanity Fair offerings of the world. We are instructed not to obey the clamoring of the flesh. We are urged to rebel against sin. By the life of Christ in us, we oppose death and destruction. We dissent by casting our vote against the belief that sorrow and endless suffering win Instead we welcome life, love, and the full work of Christ to bring all of His goodness into every aspect of our and His domains. We comply with truth. We obey our God. We respect His authority and His final say. We overcome evil with good. We defy hatred by embracing love. And we can have joy in the midst of the lamentations of our lives.